Use only original Banzai Racing Products, beware of inferior imitations that are thinner metal and use bolts that will strip out the aluminum housings and front cover! 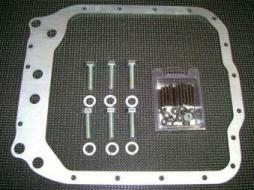 We've designed our Banzai Racing Oil Pan Brace for installation on all model FD 13B-REW motors. Its main purpose is to reduce oil pan leaks caused by engine flex. The braces are fabricated from laser cut & CNC punched 3/16" (4.76mm) steel. They are then Bright Zinc plated to prevent corrosion. We provide all new hardware for installation. The kit includes Oil Pan Studs & Nuts to eliminate the factory bolts and allow for higher torque, and longer motor mount bolts necessary for installation. We recommend installation on all vehicles, from stock to highly modified. This is the same hardware kit that are provided with our Banzai Racing Oil Pan Brace. They screw into the block and stay there, allowing repeated removal and reinstallation of the pan without stripping aluminum threads. The studs have an Allen head socket at one end to facilitate installation. The lock nuts feature attached washers with serrated faces to provide positive grip on the pan rail, and the studs are cadmium and zinc plated to resist corrosion. Please Refresh page to ensure that you have the most up-to-date version.